This small private devotional panel has only recently been attributed to Giovanni di Lorenzo Larciani, an early 16th century Florentine Mannerist painter. However, the painter’s work was already known under the name of the ‘Master of Kress’ after the title of a collection featuring three of his landscapes in Washington. It was not until the mid-1990s that a number of contracts bearing his name were found for a Nativity scene in the small town of Fucecchio, west of Florence. In the Rouen painting, as in this altarpiece, we recognise the slightly bloated features of the faces, the wave-like drape of the clothes, the sharp colours and the characteristic quasi-collapse of forms. 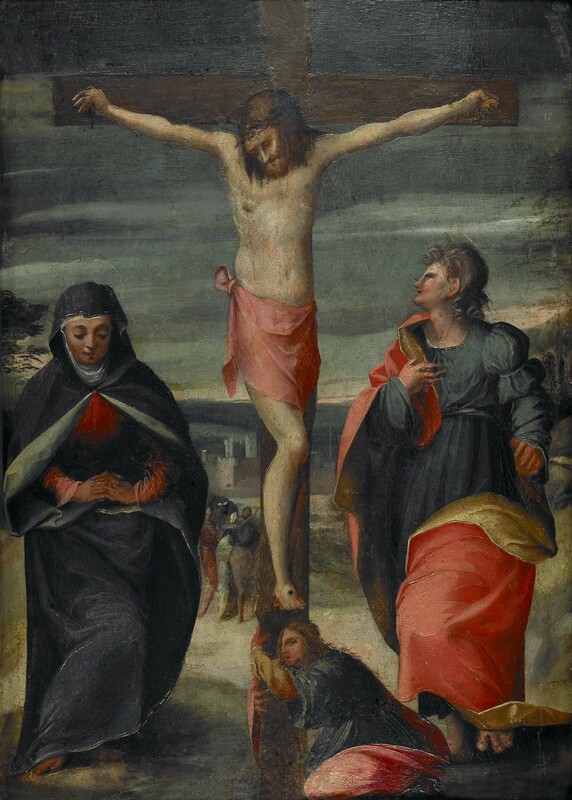 A contemporary of other Florentine Mannerist painters such as Andrea del Sarto and Franciabigio, Larciani has long been overlooked and is not even mentioned by the great historian of 16th century art, Giorgio Vasari. No doubt this was because Larciani worked at the studio of Granacci, whose faces he often borrowed. Larciani was ten years younger than either Granacci or Fra Bartolomeo, two artists with whom he might be confused. Nevertheless, his style is not only recognisable but inventive. His rather nervous drawing, bordering on the bizarre, his vibrant palette of colours and his sensual ‘impasto’ constitute a remarkable contribution to the increasingly exuberant exploratory work led by the Florentine artists in the 1520s after the death of the great Raphael, which seems to herald the work of Pontormo and Rosso Fiorentino.